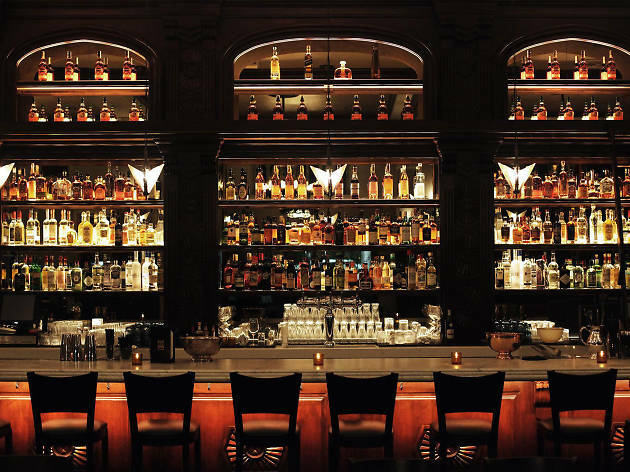 Nestled within the Hollywood Historic Hotel, The Edmon is an Art Deco lover’s dream, a bar that glows with backlit bottles of liquor and 1930s decor. A succinct cocktail menu beefs up classics (like a scotch fashioned) while presenting new creations, like the sherry-based Fall Bamboo with cognac, bitters and grenadine. To eat, an eclectic menu of bone broth and perogies exists—but the house burger is just as enticing. The classiest version of a hotel bar, step into this deco throwback off an otherwise desolate strip of Melrose. With high ceilings and perfect ambiance, this is the place to make a great first impression on a new beau. Drinks are superb, service is prompt--I only wish I'd been able to have eaten dinner. Can't wait to go back!